How to Make Bacon Roses and Strawberry Hearts for the Perfect Valentine's Day Salad - Oh, The Things We'll Make! If you're looking to make the perfect Valentine's Day salad, I'll show you how to make bacon roses and strawberry hearts, perfect for dressing up your salads or garnishing your holiday plates year round! Nothing says “I love you,” like bacon roses unless your Valentine happens to be vegetarian, of course! Lots of things have changed since then, but I still love the holiday for what it represents. I love seeing stores adorned with red hearts and roses while playing soft, romantic tunes. I have to admit that sometimes my husband thinks I'm a bit crazy, but he happened to really love this salad when I served it to him last night. “This is really good,” he said! Finally, something we can both agree on. This is really simple to make, yet very elegant and impressive. With fresh strawberries in season here in Spain, I couldn't resist adding a few strawberry hearts to the salad. I kept this salad simple to highlight the bacon roses and strawberry hearts, but you can personalize it by adding other ingredients to suit your taste. This salad would be lovely sprinkled with crumbled goat cheese and some walnuts, perhaps. I think you could incorporate the bacon roses and strawberry hearts into my festive goat cheese salad to make a more complete salad. I also normally drizzle salads like this one with a homemade balsamic reduction. It's a super simple, mildly sweet addition which is perfect for salads that incorporate fruits and/or cheeses. How to make bacon roses and strawberry hearts! Give your Valentine's Day meal a special touch with this gorgeous salad adorned with bacon roses and strawberry hearts! 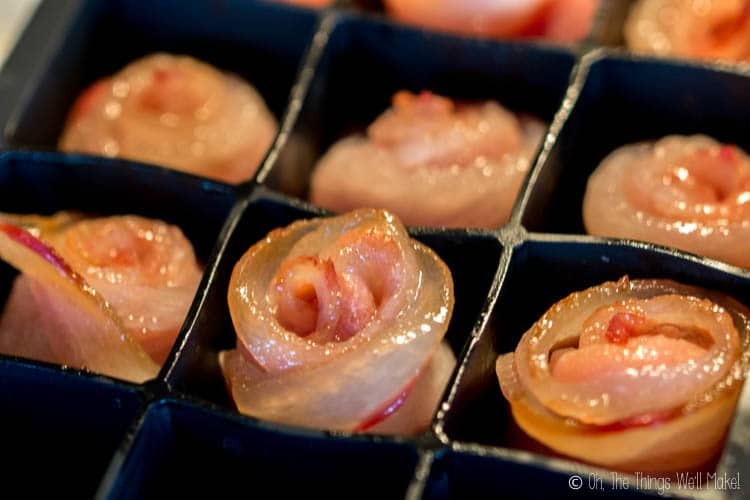 Take each strip of bacon, and roll it into a rose shape. 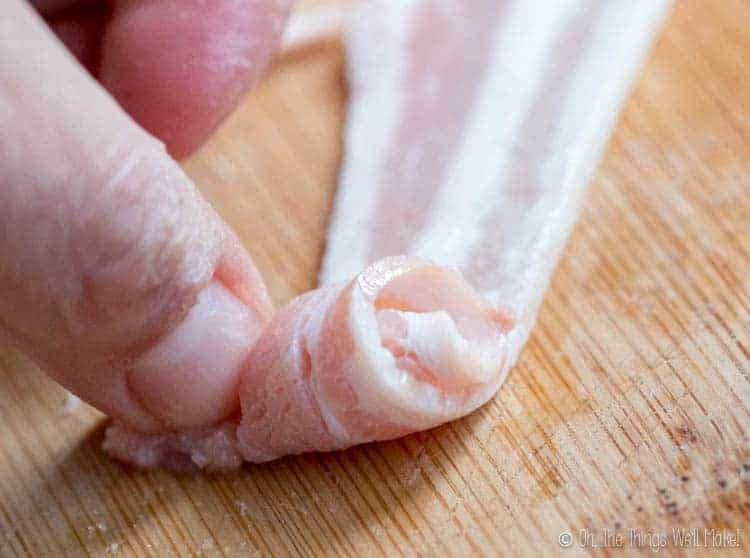 If the bacon strips are wide, you'll make more delicate, realistic looking roses by cutting them in half lengthwise before you begin rolling them up. To make them look more realistic, leave them slightly loose and let the edges fold over upon themselves at times. I used the edge with the fat on the top of the rose, and that seemed to work well. 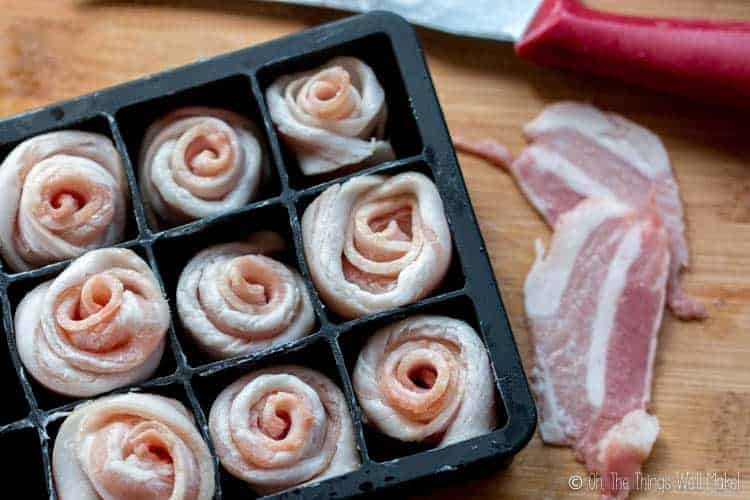 Place the bacon roses into small muffin tins or silicone ice cube trays to help them hold their shape as you bake them. I used my silicone cube-shaped ice cube trays, and they were the perfect size for holding the roses up and together. If you are using tiny muffin tins to hold the bacon roses, you may need to add aluminum foil to the tins or use toothpicks to help keep them in place. Keep checking on them to make sure they aren't falling over or burning. Bake the bacon roses in the oven until they get brown and crisp. Wash and spin dry the baby spinach leaves, and start arranging them, right side up, in small groups of leaves into which you will place your bacon roses. Cut the tops off your strawberries, and then cut a small wedge out of the center of them to make them look like hearts. Slice them in half, forming two strawberry hearts from each strawberry, or you can slice them more thinly to make more hearts out of each strawberry. Strategically place your bacon roses and strawberry hearts on the bed of baby spinach, creating a beautiful salad. Drizzle with a balsamic reduction and olive oil, or coconut oil, to taste. Enjoy! Such a cute idea! I am featuring it on Savoring Saturdays this weekend. Thanks for linking up! I’ll be sure to stop on by! I’ll be sure to stop on by. Cute! I bet I could get my girls to eat salads if they’re topped like this. 😉 Thanks so much for sharing this at Savoring Saturdays! It’s amazing what a fun presentation can do sometimes, right?